This entry was posted in Connecting with Community, Food Glorious Food, Going Green, Rambles, Waffles and Digressions by cityhippyfarmgirl. Bookmark the permalink. A great post, Brodie. I am involved in a campaign to ban plastic bags in our suburb of Beecroft, making Boomerang Bags for locals to borrow if they forget to bring their own shopping bags. We have had an amazing response from the community and the shopkeepers. And it all just started with one cloth bag sewn! Great Idea Deirdre… Good luck with it. May your idea travel far and wide! The boomerang bags are great aren’t they Deirdre. There is talk of doing a bunch of them through our local primary school which I’m hoping will be really successful. Also hope your campaign for banning the bag comes to a head. It’s ridiculous we still have them in NSW. Thanks, Brydie. We have had quite a victory in that the new Woolies that is to open in Beecroft in September will be the first to be free of single-use plastic bags. The Boomerang Bags are a terrific thing and are a great way to engage the community. Brydie, Thank you. I work in North Sydney where the choices of coffee shops are numerous. I consciously take my mug to the coffee shop either closest to me, of with the barister who spoils me, or where I can get my gluten free treats…. but I feel like a ‘sucked in’ consumer, who is caught in the trap of purchasing for purchasing sake (the coffee break is like a smoke break – a socialable moment in the day). While I appreciate my socialable chat with any of the prefered baristers, I would prefer to know I was making the best choices with my time, money and need for the human contact. Now, I can try the baristers at the responsible cafes in my area.. and if they are not socialable enough for my liking, I’ll go back to the others with the demand that they meet the responsible cafe standards …. PS I was disappointed this week to find one of my ‘not so responsible cafes’ actually used a disposable cup to prepare my coffee and then pour it into my mug! I’ve heard of that quite a bit Tamara, using a non reusable to be then poured into the reusable and it’s really disappointing. Saying that I’d say it’s a perfect opportunity to open up that conversation. If no one ever points it out to them or questions, then it’s hard to change things up. Gosh, I just read the responses above … Phew! I get so annoyed at the amount of places popping up here in Perth that HAVE to serve everything in take away containers due to some silly thing about being a deli, not a café. I’ll go there once when I’m caught out but once I know, I don’t go back! It’s appalling! One can never have too many ’emergency’ items Brigitte. That’s where all the fun stuff lives surely 🙂 I weighed it all once and realised I was carrying round two kilos of ‘maybe’s and wondered why my neck was sore?…Side tracked though, it’s different now thankfully. Go dust off that eco mug! Oh yes, I’m hearing you … Now my daughter’s five it’s getting lighter. I have my “light” hand bag and then the other one that holds that “stuff”. Ha ha! Now it’s being replaced with art journal and paints!!! EEEEEK! Thank you for making me think about this Brydie. I don’t have a lot of takeaway coffees but I am not in the habit of carrying my on cup. All of these things are habits we get into aren’t they? Have a great week. Keep it in the car perhaps Jane? And no I wouldn’t imagine you would have many takeaway opportunities your way…unless a wild goat set up shop one day. “Kids and Coffees” ? It’s always a big help when things go ‘mainstream’ and that is what ‘War on Waste ‘ has done for coffee cups . I have been to cafes where they tried to please you by filling your own cup but used a disposable cup to make it …. I imagine that is a misunderstanding of why you are making this choice , hopefully this misunderstanding is cleared up by a man in a bus filled up with nondisposable coffee cups driving down the street . This really is the time to speak up , the timing is right and cafes are listening and of course some unique cafes were listening all along. 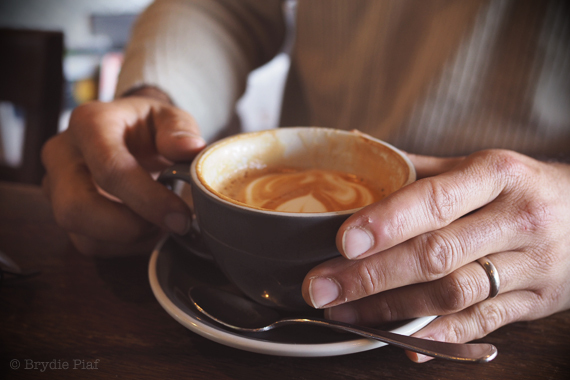 One of my favourite posts from Estabar (cafe in Newcastle ) was a photo of a man’s hand holding a plain old jar to get his coffee in …now that is the kind of place I am going to have my coffee ! 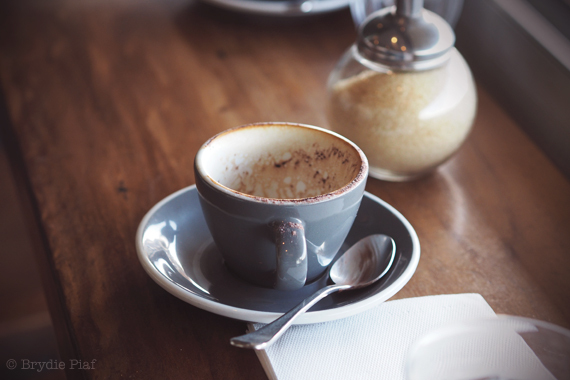 Maybe we should all slow down and enjoy a coffee in a real cup in a real cafe rather than having a disposable cup of coffee as a fashion accessory/ advertising tool when rushing around living our busy lives! I’ve been using a reusable coffee cup for years and no discount around here. After the War on Waste shows, I think it has brought about a conversation in the mainstream. On our local online community noticeboards people are outing thrown away coffee cups found at the lake from local businesses and people’s first name written on the cup. That’s not my style at all. I like to make to make personal improvements instead. Anyway I think cafes will be more receptive to the suggestion now because of Craig and the crew. I’m so glad I found your blog. So much reading to do – love it. We watched the War on Waste programs as a family and the kids were just as interested as us – gold. Thankyou so much for that link on Responsible Cafes. I rarely go out for coffee and if I do I sit and catch up with a friend and use crockery. I haven’t used a takeaway cup for many, many years. I’ll be having a chat with our cafes now – Thankyou.